As I said, Bun Rieu Cua Tom Oc (Vietnamese Crab and Shrimp Paste Rice Vermicelli Noodle Soup with Snails) was the beginning of a furious week of cooking. Bun rieu is one of my favorite Vietnamese soups. It's also the most laborious on account of shelling the crab. It's also one of the most expensive meals I've made as I spent about $30 on ingredients. Ironically, it wasn't the fresh crab that was so expensive as I went with the cheaper rock crab that are usually $1.99/lb at the San Gabriel Superstore. The tomatoes, especially out of season, were almost the same price as the crab. But a proper bowl of bun rieu cua tom oc also includes a pound of shrimp, periwinkles, curled rau muong (Vietnamese water spinach) stems, sliced banana blossoms, pork spare ribs, fried tofu, and more. Yes, there are a lot of components to bun rieu, but made properly, it will also be one of the most satisfying of Vietnamese soups. As with a lot of my cooking, I had a craaaaving. A craving in which I knew I would not be satisfied with a restaurant version of bun rieu. This is not a recipe I would have attempted until now. One of the benefits of blogging is that I recall flavors of dishes much better than I have in the past. Before, I would have been satisfied thinking something was "good" or "good enough." These days, I find myself picking apart the flavors and textures and ingredients of favored dishes. Am I turning into my momma? Ack! 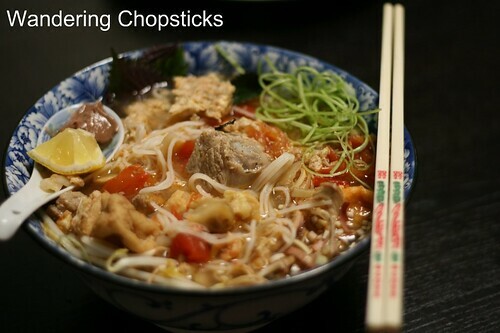 Unfortunately, bun rieu is one of those soups with which people often take short cuts. Every recipe I stumbled across online used canned crab paste. I used to think my second-youngest uncle's wife's bun rieu was great. And while it still is, I was disilllusioned when I saw her open a can of bun rieu crab paste. *Sniffle. * Even a consultation with my favored "Secrets of the Red Lantern: Stories and Vietnamese Recipes from the Heart" cookbook turned up the use of canned crab paste. Nooo!!! No canned crab paste for me! I was on my own with this one. I don't remember my mom making bun rieu often when I was growing up. Nonetheless, no adventurous recipe tackle can be started without a quick consultation with my momma. I remembered Noodlepie's photo of a "rieu" that was in one big piece, the traditional way that it's supposed to be made. The "rieu" is only broken when serving. Instead of one big piece, my mom prefers to spoon out small balls of the crab and shrimp paste actually. Ssshh! And when crabs are too expensive, she uses canned bun rieu crab paste too. Mom asked me how I planned to make the broth. Strained crab and shrimp shells. Pork spare ribs. 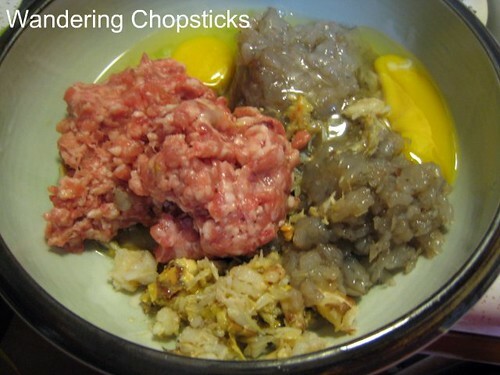 Crab, shrimp, pork, and eggs to bind them together. Well, then, seemed like I knew what I was doing, she said. And that was that. As I said, there are a lot of components to bun rieu. I've handily labeled all the key parts for you below. Make a list when you go grocery shopping. You'll need it. I made a 7-quart pot and then some. Invited my brother and his wife over for dinner. My brother's usual "compliment" is none at all and when pressed, once said: "I'm eating it, aren't I?" But that evening, they both slurped every last bit of the broth. Brother asked me how many times I had attempted bun rieu before. He was amazed. And when I offered to pack some to-go for both of them, they leapt at the chance. His wife was quite excited, and well, the only other food I can remember her getting excited about was my chicken liver pate. I still had plenty left over for the next day so I invited Tony of Sinosoul and his better half, and Gourmet Pigs and her friend. Despite groaning about how full he was, Tony still ate five bowls. Umm, you could have stopped when you hit full, instead of eating until bursting, I said. But Tony replied that he knew he couldn't get this kind of bun rieu in a restaurant and was afraid I would never make it again. Amused by the absurdity, I retold the story to Gourmet Pigs, who urged, "You're going to make it again. Right? Right?" And then her friend hopped onto her chat to thank me again for the bun rieu. Later, I told my momma all the stories - about how my brother and his wife slurped every last bit of broth, about how Tony ate five bowls, and about how Gourmet Pigs asked if I'll make bun rieu again. Despite vaguely knowing about my blog for the past several years (my oldest uncle stumbled upon it one day and told my parents), my mom hadn't really bothered to read it. Until now. What can I say? Bun rieu has magical powers. 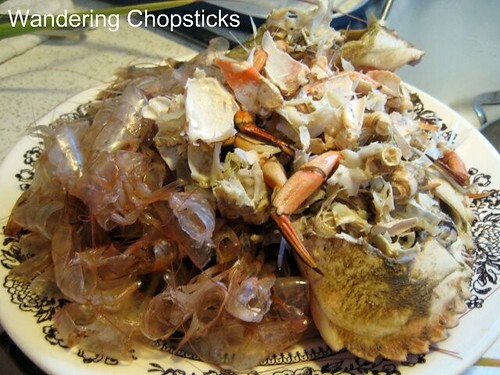 2 or 3 small crabs, boiled and meat removed. 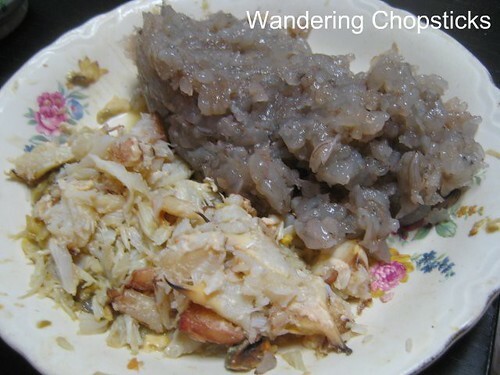 (About 1 cup crab meat). Wash and save the shells. 1 lb shrimp with heads, peeled and deveined. Save the heads and shells. Traditionally, the crab used in bun rieu is cua dong, small crabs found in rice paddies. The crabs, shells and all, are mashed and then strained. I have seen this sold frozen at the supermarket but the mixture was black, which kinda freaked me out. I bought the cheaper rock crabs at the grocery store, but you can use blue crabs or lump crab meat. If you don't know how, read my crab primer on how to select or prepare crab. Boil the crabs. Rinse them well while still whole. Remove the crab meat and the crab butter and set aside. Reserve the shells for stock. Peel and devein the shrimp. Reserve the shells and head for stock. Set the shrimp meat aside. I suggest using two pots for stock. 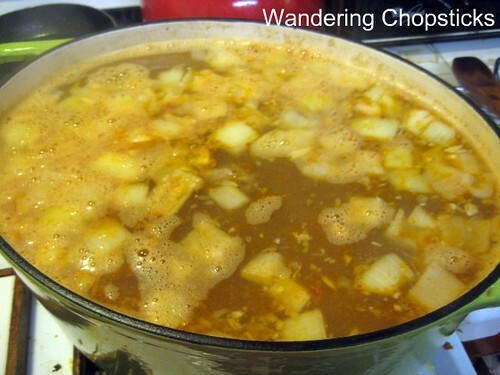 For the crab and shrimp stock, fill a 5-quart pot about 3/4-full with water and put it on high heat. 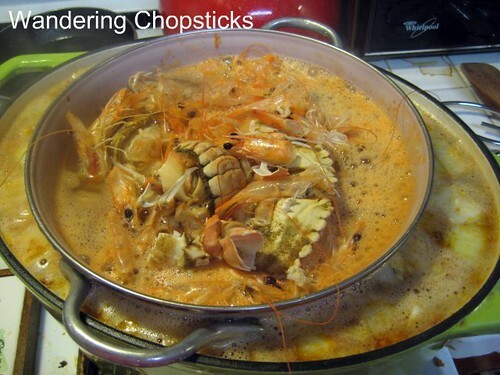 When the water boils, add the crab and shrimp shells and turn the heat down to medium and let simmer. 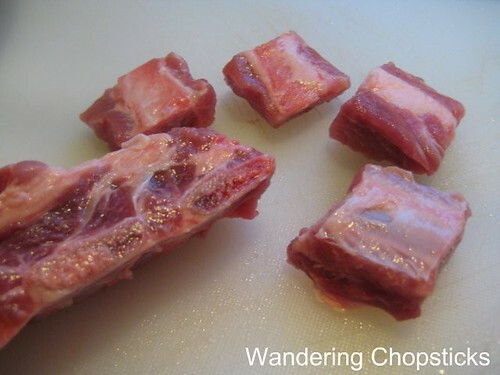 Wash the pork spare ribs and cut them into individual sections. For the main stock, fill a 7-quart pot about halfway with water on high heat. When the water boils, add the pork spare ribs and turn the heat down to medium. Let simmer about 15 minutes. Then skim the scum from the surface. Add 1 chopped onion, 1 tblsp fish sauce, and 2 tsp salt. On the left, I added the crab and shrimp shells, which will be strained later. On the right is the serving broth with pork spare ribs. I used two pots because I wanted the spare ribs to flavor the broth, but didn't want to pick out any shells. The fresh crab and shrimp. You'll need 2 tblsps of the crab meat. 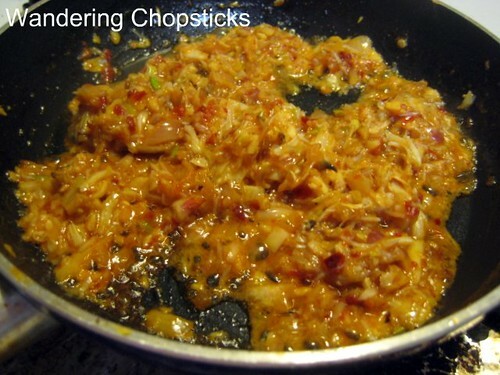 In a frying pan, drizzle a bit of oil and add the 2 tblsp crab meat with 2 finely minced shallots, 3 finely minced garlic cloves, 2 tsp fermented shrimp paste, 2 tsp chili garlic sauce. Saute until the shallots and garlic are softened and the aromas are released. There! 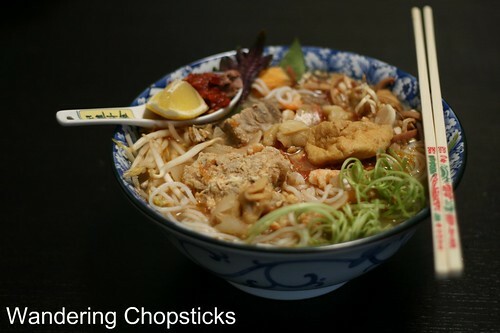 You've just made bun rieu crab paste without any MSG or artificial preservatives. Add the whole mixture to the pot with the spare ribs. Roughly chop 1 lb of shrimp in the food processor. 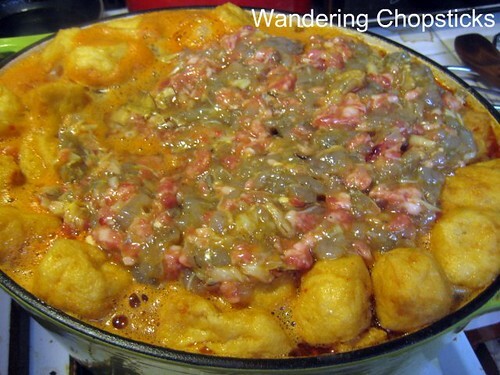 Take the remaining crab meat, 1 lb of shrimp, 1/2 pound ground pork, and two eggs and mix thoroughly. Add 1/2 tsp salt or 1/4 tsp of mam ruoc if you wish. Spread the mixture in a shallow pan. Set aside in the fridge to chill and bind. 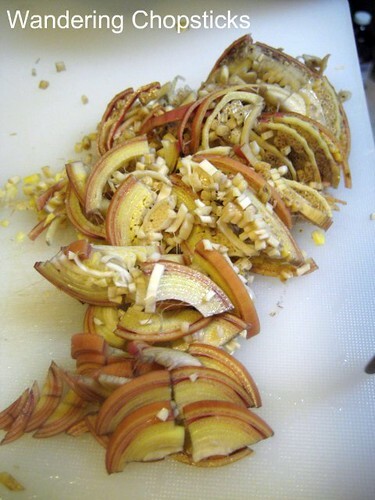 Thinly slice banana blossoms. Set aside in a bowl of salted water. Wash the herbs and bean sprouts. Split and curl the water spinach stems. 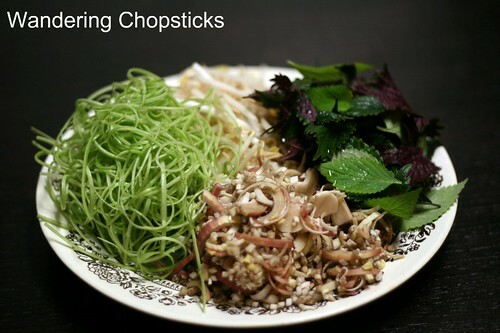 Set aside the rau muong stems in a bowl of water until ready for serving. 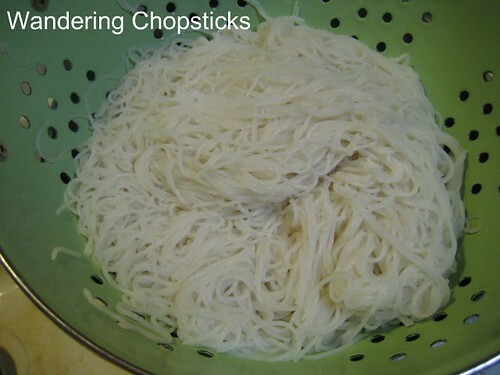 Boil the rice vermicelli noodles and set aside. 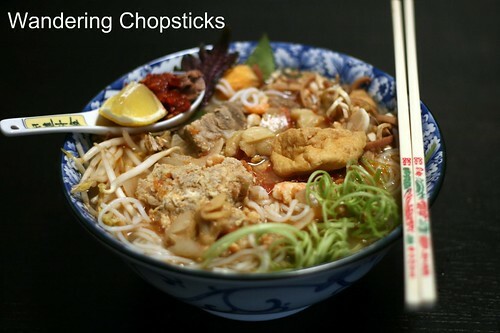 There are two sizes of bun (Vietnamese rice noodles). The thicker kind, used in soups such as bun bo Hue (Vietnamese Hue-style beef noodle soup), are often sold in straight noodle form. You'll want the thinner kind for bun rieu, sold curled in packages. After preparing all the condiments and noodles, it's time to strain the stock. 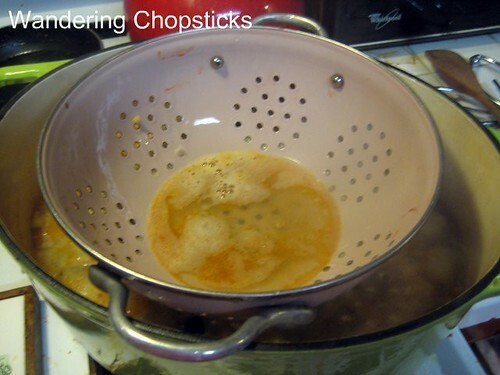 Place a colander into the bigger pot of pork spare ribs. Then slowly pour the small pot with the crab and shrimp shells into the colander. Lift the colander out and the crab and shrimp shells are already strained out for you. Easy! You may now discard the shells. 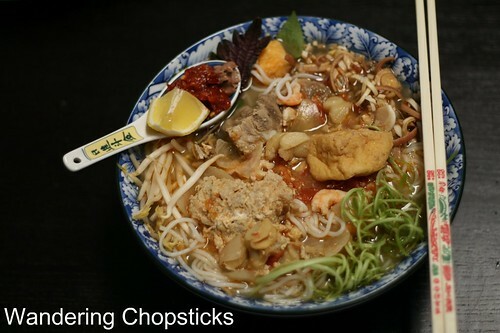 Taste the broth and season with salt, fish sauce, or shrimp paste, if necessary. Depending on how fast you work, the broth should have been simmering for at least an hour. 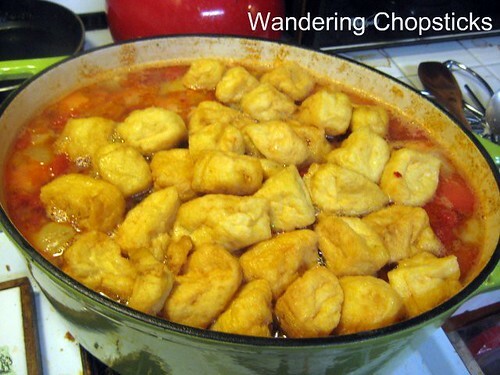 Add the can of diced tomatoes, freshly chunked tomatoes, and fried tofu. 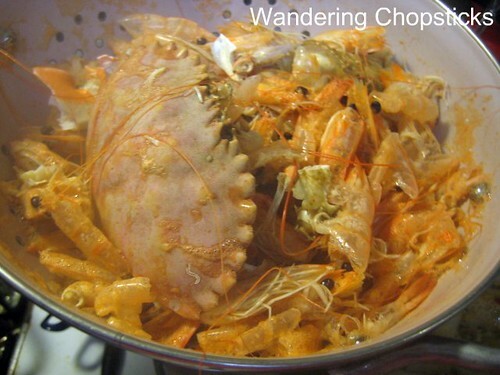 Then remove the crab, shrimp, and pork paste mixture from the fridge. Gently slide the "rieu" on top of the tofu, trying to keep it as intact as possible. I then ladled broth over the "rieu" until it was slightly cooked enough to stay whole. Alternatively, you can just form small balls of the mixture and drop it into the broth. One big "rieu." The relatively flat paste mixture cooked in about 10 minutes. Just be sure to break it up when it comes time to serve. 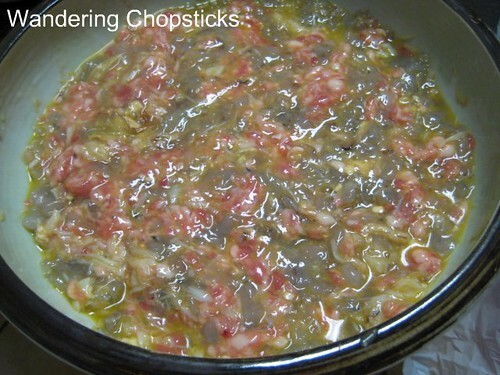 Add in the periwinkles after you add the crab paste. The sea snails were already cooked so didn't need much time. 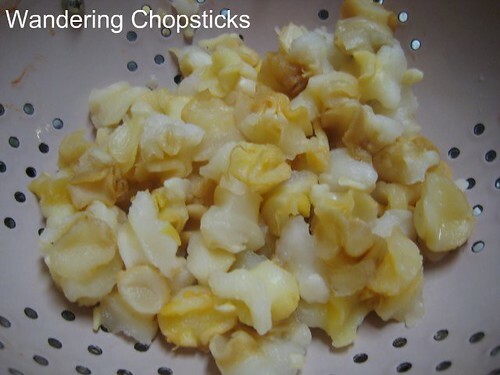 These are optional as they don't add much flavor to the soup, just a textural contrast. Add noodles to the bowl and ladle the broth over making sure to get the "rieu," spare ribs, tofu, and sea snails. Let guests garnish as necessary. For bun rieu though, the lemony flavor of kinh gioi is an essential for me. So is an extra dollop of shrimp paste. 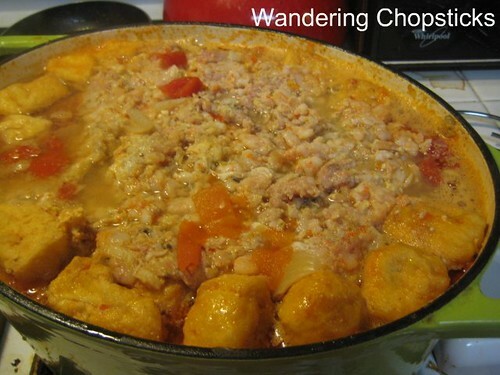 I'll tell you upfront, while bun rieu is not a difficult recipe, it is laborious. Yes, you can cheat and use canned crab paste, but as you know, that's not the recipe I'm gonna give you. Set aside a day for shopping and prep. Make a big pot since you're going through all that work. Invite family or friends. Do it right. Trust me. The results are infinitely more rewarding. 1 year ago today, jungle red hibiscus. 2 years ago today, I go cuckoo for cocoa. 3 years ago today, Pho Ha Vietnamese Restaurant - Pomona. HOLY $%#!%@$#!! So labor-intensive! This is definitely a have-to-get-mentally-prepared kind of recipe. ;) I can't believe that event he water spinach stems have tro be split! me feel hungry looking at your bowl even though I just had breakfast! the soup looks so rich and I love all the ingredients esp the snails! I don't know that I'd ever even seen a recipe for bun rieu that didn't start with the ubiquitous can ;-) And my family used to make it after church for a quick lunch -- sort of an alternative to instant ramen I suppose. Your recipe looks delectable and well worth all the work. Holy crap, how impressive! Gotta tell you, that's my kind of recipe, I love labor-intensive, nit-picky stuff. Too bad I'd almost certainly never be able to get all the ingredients at the same time. Hooray for you! I now really appreciate a bowl of bun rieu whenever I eat it :-) I can't invest that much time and effort to make my own, but everytime I go home, I have to make sure I have a few bowls. Thanks for the awesome post! This is amazing! I'm stunned in a very-very good way and my mouth is watering like crazy! I can see why Tony was worried that you wouldn't make it again. So many different preparations needed :). But the end result sure looks fantastic! Sure looks better than any noodle soup at a restaurant. Wow, that looks decadent! Now I'm scared because I want to make this. But I think I need to try it in a restaurant first. Happy New Year! Thank you so much! I have been looking for a recipe I could understand for this ever since I saw this youtube video ( video)from VN a couple years ago. And your message to your mom cracks me up. pretty bummed I wasn't invited over for this. bun rieu is one of my faves that i rarely ever get to eat! i asked my mom to make it once and she used every shortcut imaginable. this is such an impressive post! i've never had this before, and man, it looks like a lot of love went into making this. 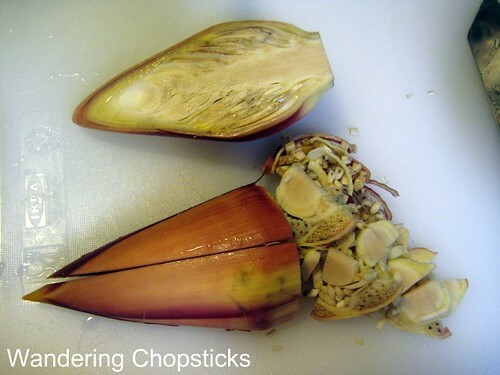 btw, what do banana blossoms taste like? This may be my favorite post of yours ever, just because of the note to "momma" which had me rofl! There's actually a tool to split the water spinach stems easily. :P It was the crabs that took the most work. I was really hard-pressed to find a recipe without that can. And the thing is, the ingredients are just crab, oil, and MSG. Most of the ingredients are fairly common. Except for maybe the shrimp paste, but you can get that anywhere these days. And the snails can be omitted. And the herb platter can be reduced to what you mostly find on hand? I want another bowl right now too but not looking forward to all that work! My cousin's aunt complains about the beef in the UK too. You Aussies! So difficult to please. I'm sure you can do a good substitute just fine. Funny thing was just the other night my mom called and asked why I would write such a thing. I said I thought she'd find it funny. Which she did because she couldn't stop laughing. So mission accomplished! It just got to the point where I knew the restaurant version wouldn't satisfy because I knew they cheat and use the can too. C'mon. You've tackled so many of my recipes, surely this is a challenge you want to try? I promise it'll taste so much more rewarding than any of the other recipes I've posted. Happy New Year to you and your family! You weren't around! You know my blog isn't real time! Thanks! Had to put in all that work for my favorite soup. Banana blossoms are a bit astringent. Acquired taste really. Haha. Yeah, my mommy was a little bewildered I made her comments public, but they're so true! Oh wow! 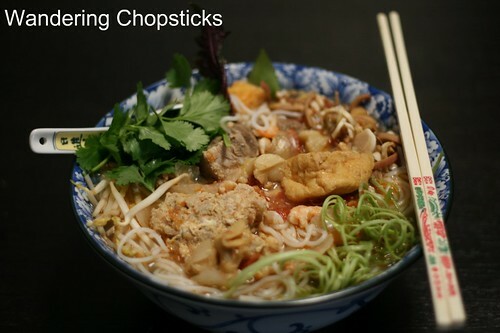 Your Bun Rieu looks awesome! I've always used fresh crab for the soup ( shell and all ) but never added pork or shrimp. I am DEFINITELY going to try your recipe. I've heard of using crab shells, but I just don't think I'd enjoy it. Perhaps cua dong shells might be less hard, but I just can't imagine eating the shells at all. 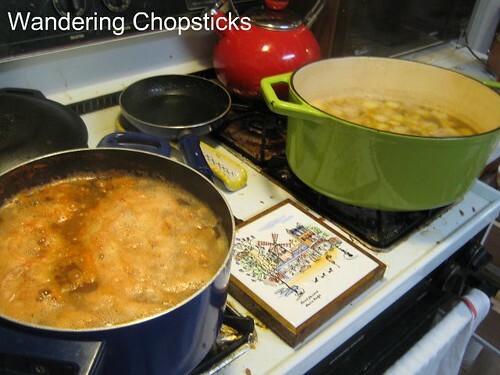 The addition of pork and shrimp is really a cheat to stretch the crab meat further. I'm envious you've had only all-crab bun rieu! Canned is not the same! And honestly, why go to all the bother of making this and then dumping in a can of the crab meat? Anyway, I love comments like yours. Makes my day. :) I can't believe your husband ate three bowls! I think my stomach would burst. I was so excited when I came across your recipe! I tried it this past weekend and my family and friends loved it! Never ever doing the premix can again!! That's awesome to hear. The pre-mix is full of MSG. I just don't get why people keep using it. Omg. I love you. I knew that I couldn't be the only person who wants bun rieu without the msg! Thanks for sharing. Hi I would love to make this for a my friends but quite a few of them are pescatarian. Would it change its flavor if i omit the pork? Do you have an idea what i can substitute it with? 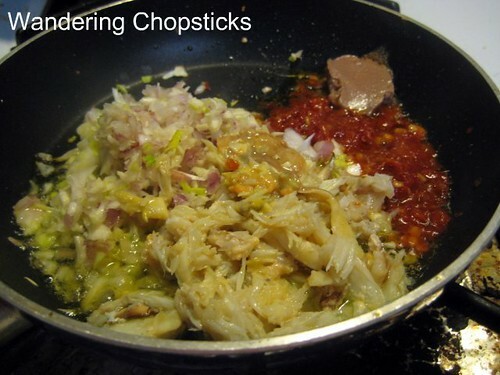 Thank you for showing us how to make the crab paste from scratch WITHOUT the can of bun rieu! I'm allergic to soybean oil and MSG so this is just perfect. And, I'm sure it will taste amazing! "Rock and Rose" and "Violets are Blue"